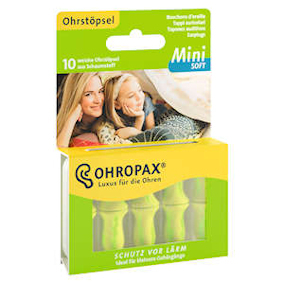 Ideal for those with smaller ear canals - particularly women and children - Mini Soft foam earplugs offer protection from snoring, loud noises and music. Also useful for relaxation and studying. These earplugs are slightly curved, making them easier to insert into the ear. The skin-friendly foam gently expands for a perfect fit. Noise reduction: SNR 35dB. Hefty protection for such a small earplug! Pack size: 5 pairs in a snap close carry case. MiniSoft are the same as Contours earplugs in size SMALL.